On Sunday, Dec. 1, the Yacht Racing Association of Long Island Sound (YRALIS) held its Annual Meeting and Awards Ceremony in the Schaefer Room at Larchmont Yacht Club. In attendance were over 80 award recipients and family and friends. YRA President Charles Powers, Lloyd Harbor YC, opened the meeting after a short cocktail hour and introduced Dave Perry, that icon of sailing rules and match racing, who delivered an excellent overview of all the action and issues with the 34th America’s Cup completed this fall. His presentation included a blow-by-blow description of how Oracle Team USA came from 8-1 down to Emirates Team New Zealand, and won the Cup 9-8, and some of the changes they made along the way to turn the table. Dave also explained what is happening now with plans for the 35th Cup. The Chairman of the Nominating Committee, Sue Miller, Manhasset Bay Yacht Club, presented the following slate of officers and directors who were voted unanimously into office: Charles Powers, Lloyd Harbor YC, president. Vice Presidents: Steve Cain, Huguenot YC and Can One Evening Race Association and Ken Hall, Riverside YC. Treasurer: Ed Yocum, Larchmont YC; and Secretary: Leonard Sitar, American YC. 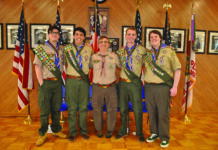 Directors, Class of 2014: Park Benjamin, Seawanhaka Corinthian YC and Ron Richman, American YC. Class of 2015: John Silbersack, Manhasset Bay YC; and Jay Rhame, Larchmont YC; Class of 2016: Charles Goodrich, Stamford YC; and Iris Vogel, Huguenot YC. Next up was the Awards Ceremony where season winners were awarded for their sailing accomplishments on Long Island Sound. Local season winners include: in IRC division: Craig Albrecht (Port Washington YC); Caper Spring, Fall and Overall (2nd). Local season winners in one-design racing: MBOD: 1. Ralph Heinzerling, Claes Larsson, Peter Bergen and 2. John Silbersack. Sonars: 1. 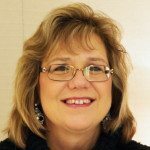 Sue Miller, John Browning. For a complete list of winners, please go to: www.yralis.org. In addition to season winners, the YRA awards Discretionary Awards where merited and this year all four awards were given to deserving recipients. The Arthur P. Davis—Beach Point Yacht Club Trophy is the YRA’s oldest award. Established in 1955 to recognize yachting achievement on LIS, it has been used to recognize both an outstanding single achievement in running an event or championship, or to recognize the long-term contributions of a particular member club or organization. This year’s award went to the Storm Trysail Club (STC) for their brilliantly realized vision of the 25th Block Island Race Week, an event that hosted over 1,500 sailors, featured state of the art race committee work and for providing another wonderful week of sailing memories. Congratulations to STC Commodore Nick Langone (Larchmont YC) and all the Storm Trysail members who worked to hard on their signature event. The Roger H. Shope Trophy is the YRA’s newest award and was established in 1998 to honor outstanding achievement in race management. Named to honor of the YRA’s 34th president, nominees must be amateur sailors or race committee personnel, their service must primarily be for a YRALIS member club and they should be members of the YRA. 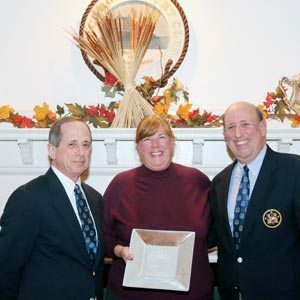 This year’s recipient was Effie Marie Smith, who has been the Regatta Chair of the Around Long Island Regatta at Sea Cliff YC for the past six years. Her leadership of the event is a case study in world-class race management. Her high level of management skills have taken the regatta to a higher level of race management that includes building a cohesive team of volunteers required to run the regatta of this type. Effie Marie has brought to the regatta a passion to organize a regatta that embraces the non-traditional PHRF sailor by welcoming both YRA of LIS members and newcomers. Effie Marie is definitely growing the sport one sailor at a time. Three more prestigious awards were presented at the YRA annual meeting and will be highlighted in next week’s column.